With the first-in-class Precor 240i StretchTrainer, it’s possible to use one stretch machine to work on a wide range of body areas, ensuring all your muscles experience a real, thorough stretching workout. Stretching exercises, as well as being a vital part of any workout, have a multitude of physical benefits in their own right, which is why it’s important to do them properly. Stretching effectively can help improve your flexibility, the range of movement in your joints, and enhance your general health and wellbeing. The Precor 240i allows you to fully stretch a range of body areas, including your: hamstrings; lower back, gluteal/hips; inner thigh/groin; hips/legs/back; upper back; quadriceps and shoulders. This makes it a great piece of equipment to ensure your body is fully prepared for a workout and adequately cooled down afterwards. Additionally, the stretcher can be used for a stand-alone workout designed to increase the suppleness of different muscle groups and general ease of movement in key areas. Click here to see the price of the Precor 240i StretchTrainer on Amazon. 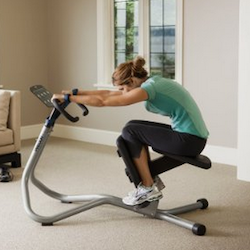 The 240i stretch trainer requires assembly, and Precor offers a service to have the equipment assembled professionally. Purchasing the Precor 240i could prove a great investment. The machine is solidly built, durable and is incredibly versatile as it can be used to effectively stretch a number of different muscles in different body areas. Basically, this single piece of equipment has a multitude of uses. And the money you invest in it could save you from purchasing several different muscle stretchers that work on individual muscles only. Basically, its high price could end up being a bargain. The machine is really easy to use, and the graphic instructions that accompany it are simple and straightforward to follow and, what’s more, the Precor 240i, with its padded seat and knee pads, is a really comfortable piece of equipment as well. Our main issue with the Precor 240i is the price. It can be argued that, if you have the motivation and the patience, you could complete effective stretches on a mat without the need for such a sophisticated, pricey piece of equipment. That being said, the StretchTrainer provides excellent guidance for a range of effective stretches, and if you know you are the type of person who would prefer to have a decent piece of equipment to ensure you’re stretching correctly, you can’t go far wrong with the 240i, least of all because of the versatility it offers. Precor has been operating since 1980 and has grown to be one of the premiere manufacturers of health and fitness equipment. Right now, U.S.-based Precor is a global brand that is dominating the market in supplying homes, hotels, spas, fitness clubs, universities, and even military bases with high-quality exercise machines. This is for good reason as they place a high priority on comfortable, ergonomic design. All this adds up to a history of innovative products and great customer service which is nice to have backing your fitness equipment investments. If you’re hoping to focus on improving your flexibility and are ready to follow regular stretching routines to achieve this, the Precor 240i Commercial Series StretchTrainer is well worth considering, mainly for its capacity to offer several different stretching workouts for a range of muscle areas. It’s not a cheap piece of equipment, but worth it for anyone who is highly motivated and serious about stretching and achieving a wider range of motion in their body.